Kalamata is a region in Greece, famous for its production of olives and olive oils. 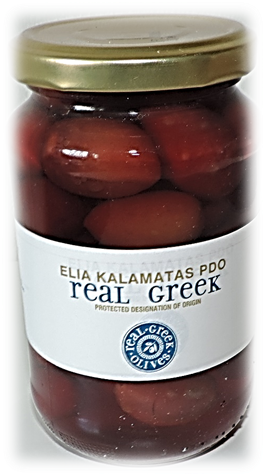 In particular the Kalamata olive is often known as the Greek olive, and is distinct in taste and appearance from most green and black olives. When Kalamata olives are not used for olive oil, which is a fairly common use, they are normally brined, packed in olive oil or pickled in wine vinaigrette. Unlike most green and black olives, Kalamata olives are a deep, rich purplish color. When they are soaked in vinegar or brined, they may appear almost dark brown or black. On the tree, these purple almond-shaped fruits are hard to miss because of their beautiful color. They also tend to pack more meat than the average black variety. Many believe the taste of Kalamata olives is superlative to other varieties. They’re celebrated for their sweetness, their rich flavor, and their difference in appearance. Depending upon where you live, it may be challenging to find these wonderful treats. If they are unavailable in your local grocery store, check specialty food stores which have an olive bar, though you can also find this variety in jars and occasionally cans. Then you can stock up on these olives, and try other varieties to your heart’s content. Olive oil is considered to be one of the world’s best oils, one of the good fats that people try hard to get into their diet. Olives of any type are great to add to salads if you’re looking to add monounsaturated fat to your diet. You can use Kalamata olives, or any other types to salads to add a natural and excellent source of fat to food. Most people suggest that Kalamata olives are a perfect snack alone, or added to cheese and vegetable plates. They’re also fantastic in olive tapenade, a rich olive spread popular in the Mediterranean.